A slight recovery in the stock market, and two months of contributions hitting my retirement savings account resulted in a positive overall performance for the month. 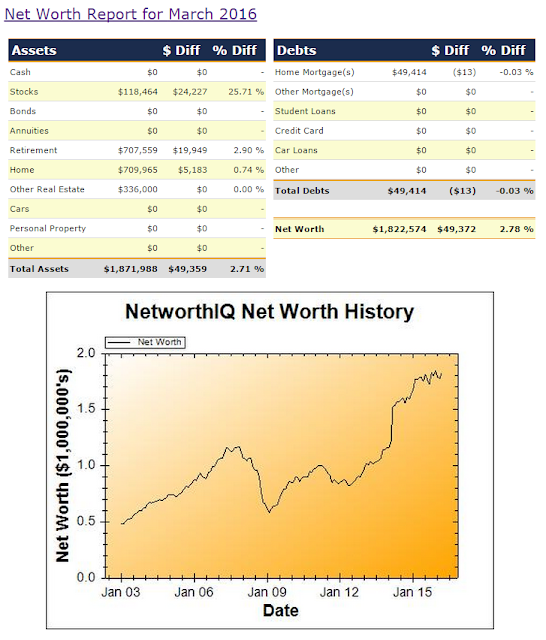 Overall my estimated net worth increased by almost $50k during March, although it still below the previous high. If the Australian stock market ever recovers to its pre-GFC level (the ASX200 was around 6800 in late 2007, compared to currently sitting around 5000 after almost a decade!) my net worth would get a healthy boost. I'm not holding my breath for a return to strong economic growth though, as mediocre 'below trend' growth seems to be the 'new normal' for Australia. A report out today regarding global migration of 'millionaires' (HNWI - individuals with more than USD$1m in assets, excluding their primary residence) listed Sydney as the best performing city, in terms of net increase in the number of millionaires due to migration. This probably helps explain the continuation of the property boom in Sydney.